Your Next Home: Custom or Modular? In the past, any home that was built in a factory and not on site, was considered inferior, humble, unsafe and perhaps recalled images from the film "Deliverance." However, improved manufacturing techniques, customization options and improved industry image are leading consumers and professionals to say that permanent homes built in a factory are often the best option for those building a new home. 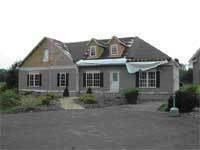 On-site: On-site, also known as "stick-built," is the traditional home built by the traditional builder. For years, these homes have been considered far superior due to their customization and on-par strength. Manufactured: These homes are also known as trailers, doublewides and mobile homes. In the movies they always seem to attract tornadoes. In real life, if a tornado touches one of these structures, good luck to anyone inside. Manufactured homes are regulated by a national code that was written in the '70s. Modular (systems-built): These homes are pre-built in a factory, one section at a time. All the plumbing, wiring, cabinets, flooring, walls and exterior are finished before the house leaves the factory floor. Then the sections of the house are shipped to the home site, dropped into place by crane and put together. 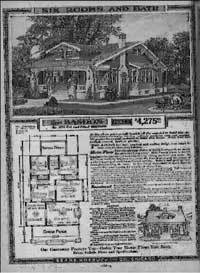 These homes have been around since the Sears Catalogue began offering homes in the early years of the last century. Modular homes follow the same regional housing codes that on-site homes must abide by. Panelized (systems-built): Panelized homes are very similar to modular homes except that they come off the factory floor in panels (roofing, walls, floors, etc.). The panels are then dropped into the foundation of the house by crane. Panel homes are not as common as modular homes and they too must abide by regional housing codes. To make things simple, from this point on, modular and panelized homes will be referred to as "systems-built housing." Buying or building a home is usually the most expensive investment a person will make and it's an investment that is getting bigger every year. According to the National Association of Home Builders (NAHB), the average cost of a new home has increased from $158,700 in 1995 to $292,200 in 2005. There's no end of information about one type of home versus another, but the most straightforward advice any respectable builder will give is: Do not buy a manufactured home (a trailer, mobile home, or doublewide). Besides the structural problems, there are financial considerations, as the Conseco Finance saga illustrates. Simply put, houses appreciate, manufactured homes (trailers) depreciate, just like cars. Therefore, a house is an investment, a trailer home is just another expense. Many consumers tend to throw all factory homes into the same pot. But these days, there is almost no common ground between manfuactured homes and system-built homes, and there are more reasons why systems-built homes are superior to manufactured homes than there are words on this page. To begin with, manufactured homes are poorly built. Since they are not technically permanent structures, they are not required to follow local building codes. Tornadoes and hurricanes are not too picky about which buildings they destroy. However, when news organizations need the most tragic images and stories, they know right where to go after a storm -- the trailer park. That's because these structures are built on thin steel frames, wrapped in a thin exterior. Manufactured homes also are prone to toppling in high wind. They are lightweight structures that are usually not permanently fixed to the ground, but rather rest on the wheels that the structure was built on. Efforts have been made to improve this industry's image. But even improved building methods do not fix the structure's inherent tendency to topple over. Also, like the automobile industry, the manufactured-home industry works through a dealer system. Professionals say that those dealers continue to soil the manufactured housing industry's image by taking advantage of the often nearly-destitute consumer who can't afford anything sturdier. "I went to Southern Showcase Housing to trade in my single-wide mobile home for a new doublewide and parcel of land," wrote Robert of Hendersonville, N.C. "Once there, the manager, Mike T., told me, 'no problem.'" Mike played all sorts of mind games with Robert and his family for eight months, agreeing to sell them one mobile home after another and then not following through -- not returning their money and finally, forcing them out of their current manufactured home and into a motel. The company, Southwestern Showcase, checked Robert's credit more than 20 times, damaging what once was a near perfect credit score. With nowhere else to turn, Robert and his family were forced to sell the one acre property they had hoped to move to and instead, move into Mike's dilapidated trailer park. The games trailer salesmen play don't do much to help the systems-built industry. Chard Harvey, deputy director of the Modular Building Systems Association (MBSA) said that since many people confuse manufactured homes with systems-built, the manufactured-home dealers who rip off consumers mar the whole factory housing industry. He said the dealers will even go so far as to try and convince the consumer it is a systems-built home and not manufactured. "The best way to avoid falling into their traps is to not buy a home from a dealer," Harvey said. 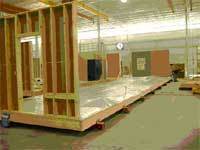 Materials for a home are assembled in the factory. 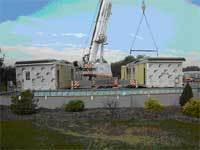 The house modules move from station to station in the factory, on a level, movable track. Cabinets, flooring and the rest of the interior is finished. The finished module is wrapped in plastic to protect it from the elements during its trip from the factory to the home site. Once delivered, a crane sets the modules into place. A few final touches and the house is complete. Once you get past the confusion over trailers and systems-built homes, most nonbiased professionals will say that systems-built homes are usually superior, beating out on-site homes in almost every way. The most obvious advantage is strength. "The home is built strong enough to be lifted at the factory by crane for setting atop a steel trailer for transport, then driven at 65 MPH down a highway, pushed or dragged on its trailer over an often hilly and rough construction site, and lifted again by crane for final 'set' atop its foundation without falling apart. (Try this with a stick-built house. )," Daniel Friedman, New York housing inspector, lecturer at Harvard University and architect, wrote on his website. "At the Contempri factory in Pennsylvania on a modular home construction tour about a decade ago, suddenly all of the workers and managers dropped their tools, ran to their cars, and drove madly out of the factory parking lot," Friedman continued. "We followed to see what was happening. One of their modular sections was being towed on Interstate 84 when the trailer disconnected from the towing tractor. The tractor drove ahead. The trailer ran off the highway at 65 MPH. The trailer ran head on into the end of a steel guard rail. The trailer stopped. The modular home section kept going, and impaled itself centered atop the guard rail. When we got to the accident, there was no debris anywhere except where the guardrail had punched out of the rear wall of the modular home section. You could look in windows into the kitchen where the cabinets and appliances were perfectly in place." 1. 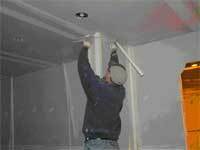 They use 20-30 percent more materials (lumber, thicker drywall, etc.) than an on-site home of identical size. 2. They are strictly regulated. Since the homes are built in a factory, often by precise machinery, there are almost no manufacturer defects. It's a highly controlled setting, more like an automobile assembly line than a traditional building site. 3. Since the home arrives basically pre-manufactured and was built indoors, the wood is not exposed to the elements without a roof for what sometimes amounts to many months for on-site construction. Kevin Thompson of Long Island, who has remodeled homes for 28 years and has extensively researched new homes in the northeast, said new on-site homes are notorious for suffering from water damage. According to a 1993 Federal Emergency Management Agency (FEMA) report following Hurricane Andrew, "Overall, relatively minimal structural damage was noted in modular housing developments. The module-to-module combination of the units appears to have provided an inherently rigid system that performed much better than conventional residential framing." Beyond the strength of the building there are other advantages. Many systems-built homes can be ready for move-in within 2-6 weeks following the start of construction. Another advantage is that the consumer does not have to worry about their builder flaking out on the job, taking many months or years to complete the home or using cheap lumber. There's also the risk that the builder could go out of business or file for bankruptcy halfway through the construction of a house and just never finish it. The ConsumerAffairs.com database has hundreds of complaints from consumers who were ripped off, mistreated or misquoted by on-site builders. "We contracted Majestic Homes to build our new home in Port St Lucie, Florida, on September 7th 2005," Wrote Kristen of Pampano Beach. "They told us our move-in date would be approx. 12 to 14 months from the closing date. As of today 08/10/06, they still have not started construction of our home, and we are only 1 month away from our 1 year mark. It took 8 months for the builder to send our permit package to the city of Port St. Lucie, and St. Lucie only took 3 days to issue the permit. Our permit has been issued for 3+ months and still no construction. We have contacted the builder numerous times by email, fax, phone and certified mail, but still have not received any response." A consumer should always check the references of any builder, Mansour Jaribiom, President of Nima Custom Homes in Ijamsville, Md. said. "In each area of the country there is a homebuilder's association," Jaribiom said. "Check their report with that association and see if they have won any awards and go visit some of their more recently built homes. And of course, call all their references." Jaribiom also suggested visiting any of the builder's current projects. Traditionally, systems-built homes were believed to be showroom boxes without much leeway for creativity. However, according to Harvey, systems-built homes now have almost unlimited potential in size and shape. He said most manufacturers allow the customer to bring in an architect to work with their designers. 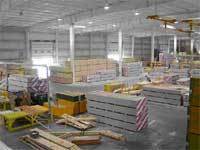 On-site builders still contend that they have the advantage in customization. "With stick-built, you can do whatever you want," Jaribiom said. Jaribiom admitted that it might be easier for a consumer to build a systems-built home on a flat slab, but said that on uneven terrain, a consumer will need an on-site builder. Affordable systems-built homes are often limited by their exterior as well. "With a stick built home, you can do whatever you want," Jaribiom said. "Brick, stone, whatever. Another misconception is that systems-built homes are vastly less expensive than on-site. Harvey said that although they may be slightly less, the savings that is created by the mass production of a factory line is offset by the increase in materials and transportation. Factories throughout the country are constructing homes for every type of neighborhood and consumer. "There are enormous, $10 million modular mansions being built on Long Island every day," Thompson said. Although systems-built homes are regarded as being generally superior, like all industries, quality varies and some factories make better homes than others. Thompson toured a couple of factories a few years ago when looking to build a new home. The first was Avis America in Avis, Pa. Thompson said he was impressed with their professionalism and workmanship. He noted that between each stud in the walls, Avis installed planks of wood. Aside from eliminating the need for a stud detector, it vastly improved the rigidity of the home. Then he went to Excel Homes in Liverpool, Pa. Although their homes were significantly less expensive and their waiting list shorter, he was not impressed with the workmanship of their homes. "They were driving nails into the sheet rock," Thompson said. "The construction was very poor." "I would urge a consumer to visit at least two or three plants," Thompson said. "They should try and go while the plant is actually manufacturing homes. Don't just look at the homes they have on display." Thompson also suggested consumers who are not construction-savvy take a friend who knows what to look for. 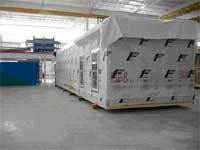 For a list of systems-built manufacturers, visit the NAHB website or the MBSA list of modular builders. Also be sure to check our House & Home section to read other consumer's past experiences.